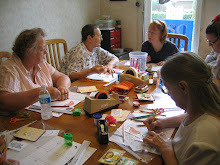 Terry is offering Part 2 of her Dylusions Journal class on Sunday, April 13. She invites you to come play with the fantastic Dylusions Spray Inks and create a "unique" and "original" journal spread. You will use sprays with stencils and as paint as you explore various ways of using these vibrant inks alongside the fun mix and match Dylusions stamps. When: April 13, 2014 from 2 - 5 p.m.